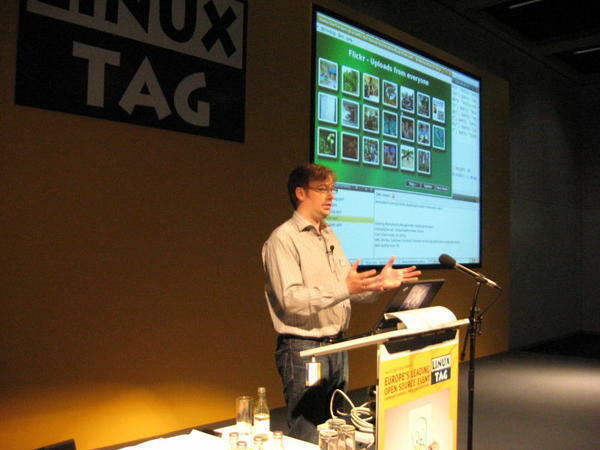 In his keynote at the LinuxTag 2009 in Berlin, KDE founder Matthias Ettrich spoke about the future of user interfaces on mobile devices. In the process he presented QML, the newest development from his employer Qt Software. KDE&apos;s and Qt&apos;s Matthias Ettrich presents QML, a Qt extension for modern GUI development. Ettrich's talk was titled "New user interface paradigms on mobile devices" and addressed GUI developers. He began with a bit of history: ten years ago programming was at the forefront of development, with UIs "quickly assembled in about two hours." That has since change. Users now demand much more sophisticated UIs, and make purchasing decisions based on them. The whole paradigm of GUI development has thus shifted. Graphics processing is faster, resolutions better and mobile devices provide new input mechanisms. These conditions, according to Ettrich, require diverging from the traditional development model. No more boxed, rectangular widgets. These components are much too difficult to turn on and off, scale or otherwise change, and don't allow consistent backgrounds. "The boundaries should no longer be set only by technology but by the creativity of the developer," offered Ettrich. As a tool that represents this new style of thinking he presented QML, a declarative UI language from Qt Software's development lab in Brisbane, Australia. QML is an extension of the existing Qt Toolkit and is under LGPL licensing. Ettrich showed some sample applications that he created onstage using Qt Creator to showcase the new QML language. He demonstrated the properties, states and transitions that are typical for QML. A Qt Labs blog presents a video of QML in action and some sample code. It also includes links to the Windows binaries and Gitorious source code repository. Boss of development from Qt Development Frameworks, Lars Knoll, places emphasis on attractive user interfaces. KDE founder Matthias Ettrich was awarded the highest accolade available in the German Republic for services to the common good on Friday.